Are your autographs for sale? No, we are just Star Wars fans enjoying the hobby of collecting autographs and meeting those who make the franchise possible. Why is there a watermark on the pictures? Unfortunately there are people who copy pictures from the internet, reprint them and sell them. That is unfair not only to us collectors who pay for these pictures, but also to the actors, actresses, producers, etc. who take their time to meet the fans and sign autographs for them. Is this an "official" Star Wars blog? No, this is just a fan made blog. Please read the trademark section of this blog for more information about this. Are you on Facebook or any other social media sites? Can you give any recommendations on autograph collecting? We are just fans with no professional expertise on this hobby. 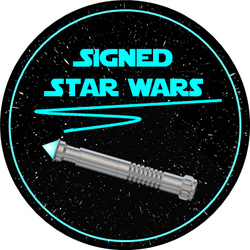 But every now and then we will publish opinion articles on Star Wars autograph collecting. Be sure you like us on Facebook for more updates. Can you get me in contact with the actors/actresses? Unfortunately no. But every now and then we will publish the address for their official websites where you can get their autographs. Be sure to like us on Facebook for more updates. Can I ask you to get me some autographs next time you go to a convention? Unfortunately no. We are just fans sharing our passion for Star Wars and autograph collecting. But, be sure to like us on Facebook, because every now and then we will publish the address of websites that are open for pre-orders on Star Wars autographs.